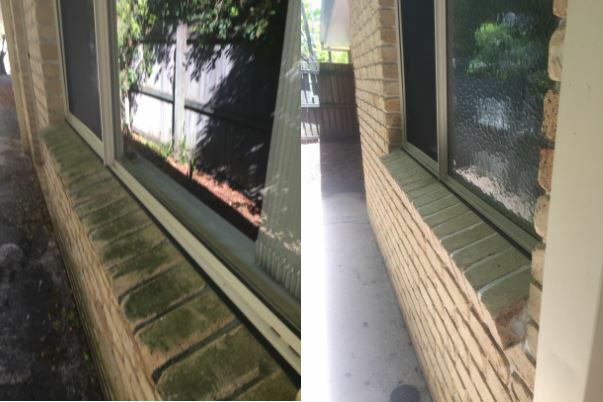 Soft washing is a low pressure method of cleaning exterior surfaces which is combined with the use of bio-degradable chemicals to remove mould, algae, mildew and other biological material as well as other stains without causing damage to your surfaces or plants. Why is soft-washing the ideal method for external cleaning? Why is soft-washing a long-lasting alternative to high pressure cleaning? Where can I find more information on soft-washing? Soft-washing has been used in the USA for over 20 years. Originally the operators there used small hand operated pumps to apply chemicals to clean. While effective, this was very slow! Over time, the delivery method of chemicals has improved dramatically. In Australia, soft washing really began only in 2017 but we have the advantage of the years of experience from the USA. We have the most up to date methods for Soft-Wash and as you would expect, The Pressure Clean Experts are pioneers in this technology. 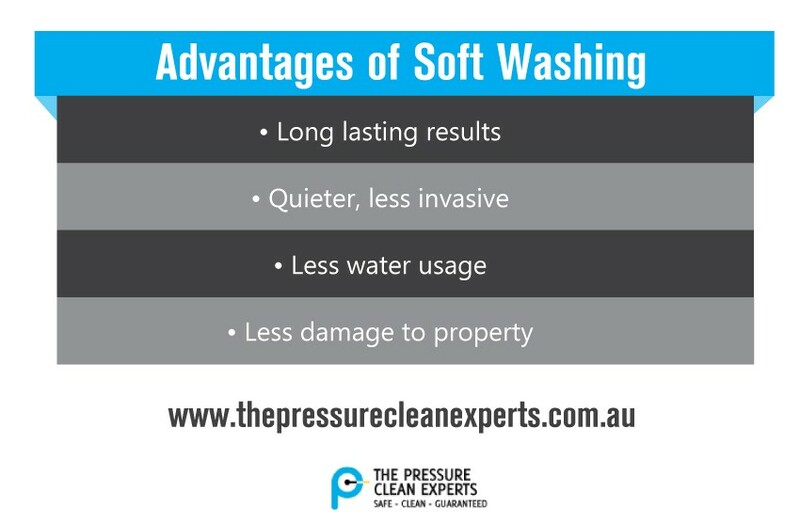 Soft-Wash relies on the use of very low pressure and appropriate chemicals to effect a clean. Unlike traditional pressure cleaning, soft-washing does not abrade the surface and produces a longer lasting result. You can think of Soft-Wash like washing your car: using the right chemicals and proper pressure will help it look better and the surface will last longer. It also protects the value of your asset! To keep your home or commercial building in top condition, we recommend and annual clean of the walls. Roof cleaning is not needed as often: in fact a thorough soft-wash on your roof can last up to 3 -4 years. Chemical wash is the preferred method for tin roofs according to Bluescope Steel Australia. Low impact on tile roofs and no damage to protective coating on tiles. Virtually silent operation which means we won’t disturb you or your clients. Application is done under very low pressure so there is almost no “drift” of chemicals. Soft-washing produces a longer lasting result and does not abrade the surface. The Pressure Clean Experts are EPA compliant. We do not allow run-off to the stormwater system. The Pressure Clean Experts hold Safe Work at Heights qualification. Soft Washing: The ideal method for external cleaning. Soft-washing is ideal in two main areas of external cleaning: roofs and walls. As discussed earlier, soft-washing is the preferred method for cleaning tin. It is also perfect for cleaning tile and terracotta roofs. Rather than blasting away on concrete tiles, or hammering your tin roof with high pressure, consider soft-washing first. This method is much more gentle and does not damage the surface. 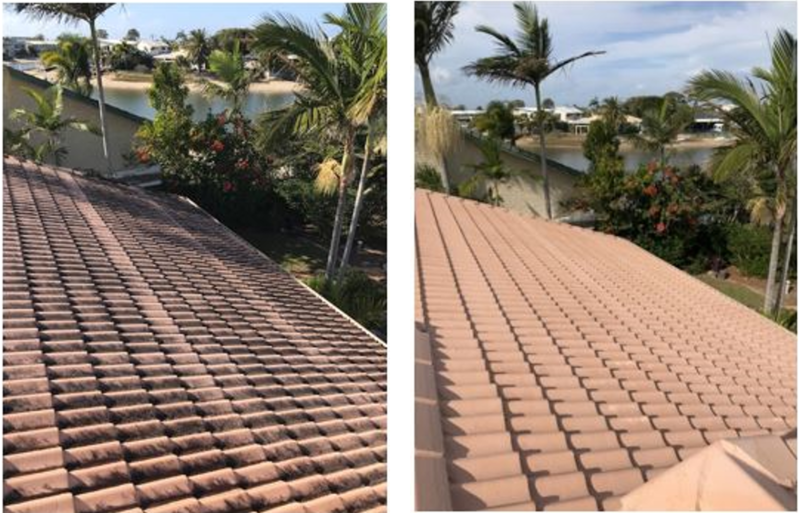 With tile roofs, high pressure cleaning can also cause colour loss to the tiles and it is possible to force water up under the tiles if you are using high pressure. High pressure cleaning is generally used clean hard surfaces. Most are aware of this traditional method and many people we meet own a small home style pressure cleaner which often sits unused in the garage! Until very recently this method was also used to clean roofs and houses. While there is a place for high pressure cleaning, roofs, walls, fences and decks are generally best cleaned with low pressure. Soft-washing began in the USA about 25 years ago when the early pioneers discovered that the right chemicals and appropriate application method could effectively clean and sanitise most surfaces without causing damage. Since then, the method of application and the ratio of chemicals has been perfected. This method is now known as soft-washing. Forward looking cleaning companies are bringing this revolution in a caring wash process to Australia. We are benefiting from the experimentation done in the USA and now have effective and safe ways to tackle roof and house washing without causing the damage often associated with high pressure blasting. A soft-wash low pressure clean uses chemicals in a process that avoids the problems caused by simply blasting away. We have a specific mix and ratio of chemicals depending on the surface being cleaned. On the other hand, rational pressure cleaning is a mechanical process that can damage the surface. This mechanical approach is effectively duplicating the normal degradation process of your roof or walls, but because it is high pressure it as actually speeding up the deterioration. Two other key advantages in using soft-wash cleaning. First, this process regularly produces longer-lasting results:-often up to three times longer than traditional pressure cleaning. Because the use of appropriate chemicals, often in combination, we tackle the underlying problem, such as spores, which have caused the unsightly, dirty appearance which led to the cleaning being needed. Soft-washing is often faster than a traditional high pressure clean too. For our clients this means that we are not in the way for long while we clean. Secondly, home or business owners who have asked a soft-wash company to clean their buildings have also regularly commented that it’s a much quieter, less invasive and noisy process. The environment also benefits, and crucially here in Australia, we use less water. We have purpose built equipment to complete a soft-wash. Our system uses a 12v electric pump to apply our cleaning mix at very low pressure. In fact the pressure is not much higher than the tap pressure at your property. This means there is virtually no change of damage to the surface we are cleaning. As mentioned our process is virtually silent so anyone working from home or in a business wont even know we are working. If you want a tile roof, colorbond roof, fence, house walls, or complete property clean – or simply have a key problem area, perhaps with lichen, moss, or algae, then it’s worth investigating Soft-wash. Bluescope Steel also recommend soft-washing as the preferred method for cleaning Colorbond roofs. Using a soft-wash on a tile roof also minimises the likelihood of damage to tiles and doesn’t abrade the protective surface of the tile. It’s often likely that a longer lasting clean will be delivered, and that less damage will be caused to your property. To find out more about how Soft-washing could be a viable alternative for your cleaning needs, contact us today.